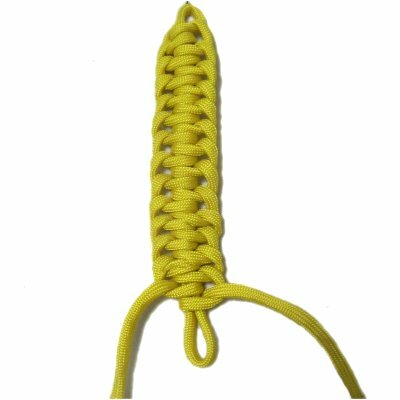 Description: The Portuguese Sennit is a series of Square knots tied around a loop. It's sometimes called the Solomon Bar. In the final step, one loop at the top is pulled, which removes the one at the bottom and secures the ends. 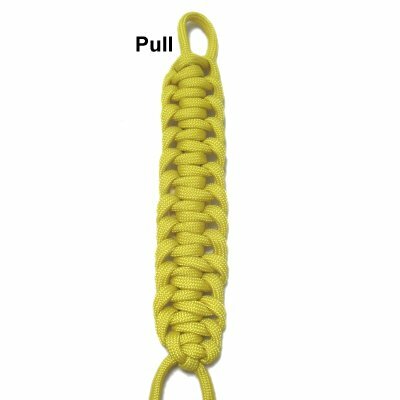 This technique can be used when you need a strong stable loop, followed by knots, such as in a plant hanger. It's also a nice way to make a key ring. The Genoese Sennit is also described below, since it is a similar technique. 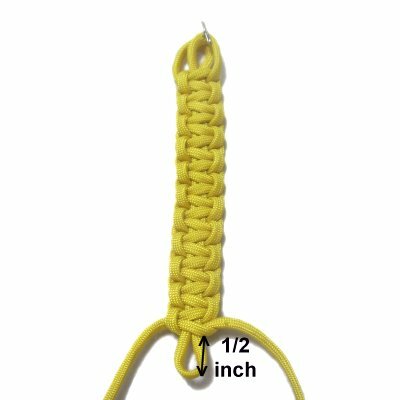 The knot featured is the Alternating Half Hitch instead of Square Knots. 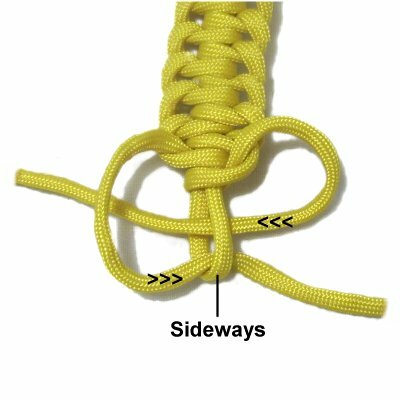 Be sure you know how to tie a Square Knot as well as the Alternating Half Hitch (with holding cord) before you get started. Step 1: You need one cord 60 inches long to practice the Portuguese Sennit. Fold the cord at the center, crossing the ends left over right to make a loop. Secure it to your board vertically. The loop should be 5 inches long if you are practicing. 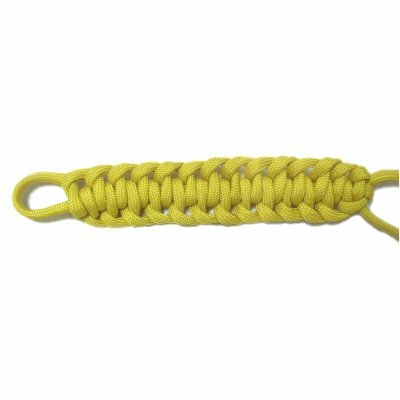 Important: When using this technique in a Macrame project, cut the cord at least 12 x the finished length you want to make. 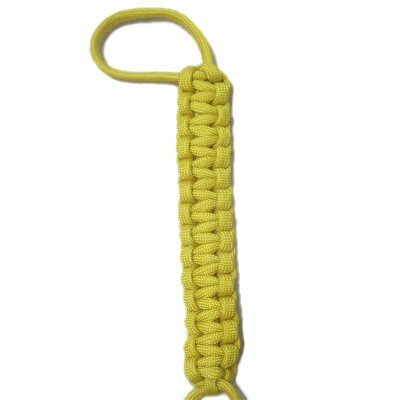 The finished length includes the knotted portion and a loop at one end. 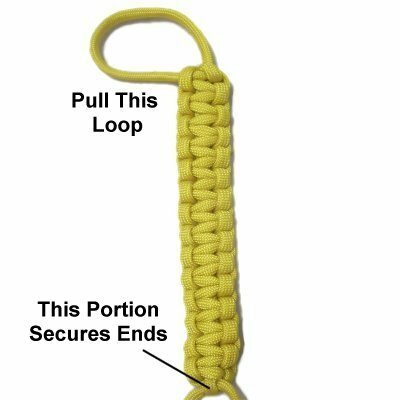 You make the first loop at least 1-inch longer than the finished length so you can tie extra knots, since the knotted portion compresses during tightening. It's usually 1 to 2 inches shorter after tightening. Step 2: Use the two ends to tie the first Square Knot. The loop acts as the filler cords. Tighten the knot 1/2-inch from the crossing point. This image shows only the first half of the SK. Step 3: Tie several more SK to complete the sennit. 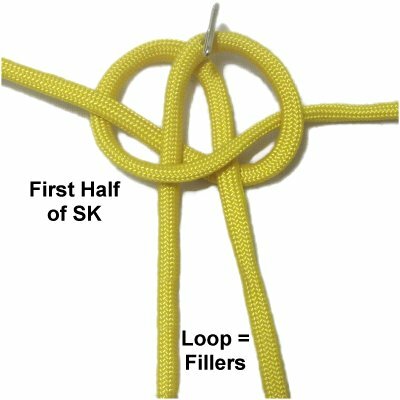 The last knot should rest 1/2-inch from the folded area of the loop. Step 4: At the bottom of the Portuguese Sennit, turn the loop sideways, so the opening is horizontal. Pass the ends through in opposite directions. Step 5: Pull the exposed segment of the loop at the bottom of the design to remove ONE of the areas at the top, which look like small loops. This is optional, if you prefer to keep both intact. Step 6: Pull the remaining loop at the top of the Portuguese Sennit to secure the ends. The Genoese Sennit is another knotted design with a loop at the top. You will be tying Half Hitches instead of Square knots. You can do the same thing with Vertical Larks Head knots, if you wish to experiment. Step 1: Repeat step 1 in the instructions for the Portuguese sennit. The length of the loop should be 1-inch longer than the finished size you are aiming for. Step 2: The loop holds the knots, so secure it at the bottom (with tension). 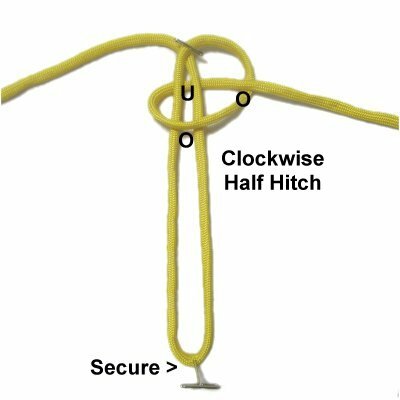 Make a clockwise Half Hitch with working end on the right, passing over - under both halves of the loop, and over the working end. Tighten it 1/2-inch below the crossed area. 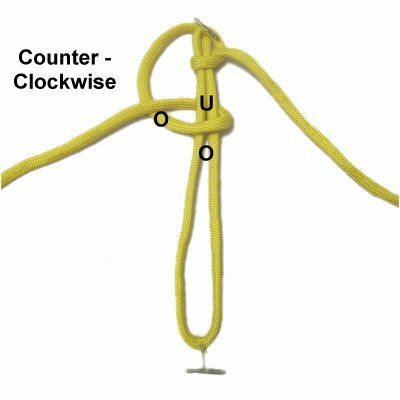 Step 3: Make a counter-clockwise Half Hitch with the working end on the left. 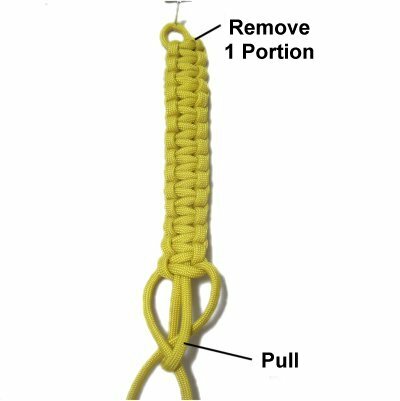 When you tighten the second Half Hitch, pull the cord so the left portion of the loop is removed. Keep the right portion secured. This is optional if you prefer to keep both segments intact. 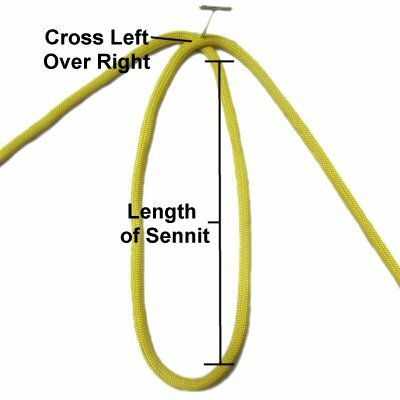 Designer's Tip: By removing one portion of the upper loop now, the completed sennit will have a smaller loop at the top (1-inch). Step 4: Repeat steps 2 and 3 several times, alternating between the two working cords. 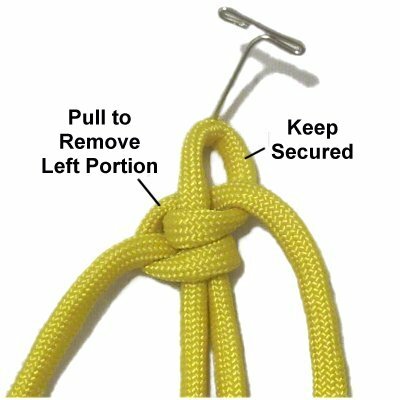 Stop when the last knot is 1/2-inch from the bottom of the loop. 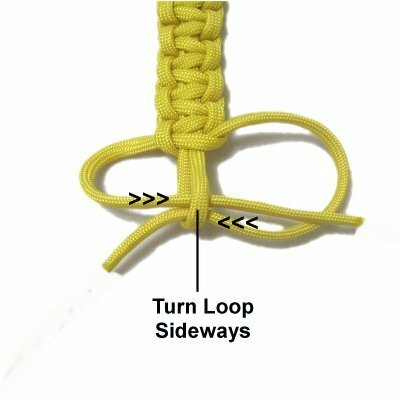 Step 5: Turn the lower part of the loop sideways, then pass the ends through in opposite directions. Step 6: Pull the loop at the top, which will secure the ends at the bottom. Have any comments about the Portuguese Sennit? Contact Me.